The Victorian election gave Labor a landslide win. Apart from Steve Bracks’s demolition job in 2002, it was the worst defeat the Victorian Liberals and Nationals have suffered in sixty-five years. Barring extraordinary events, Labor looks set to run the state for the next eight years. 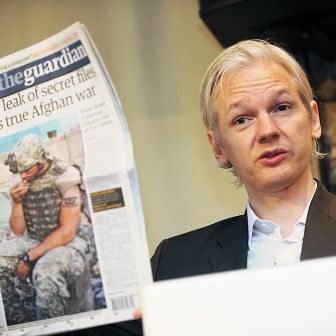 Many have written about the reasons for this, and the political consequences. This was my take in the Age, and among the stand-outs were James Campbell in the Herald Sun and Paul Strangio in the Conversation. The critical element in most commentary is the same. The times have changed, yet the Liberal and National parties have let themselves be dominated by a clique bent on resisting change. Menzies isolated his right-wing rebels. Today’s Liberal leaders have given them veto powers over policy and party matters alike. This will change only when the sensible moderates of the party agree that the only way to stop the right-wing fringe taking it over is to go into battle. Monday morning’s intervention on Radio National by Senate president Scott Ryan was an important sign that some of them are taking the fight to the bullies of the right and the Murdoch media. 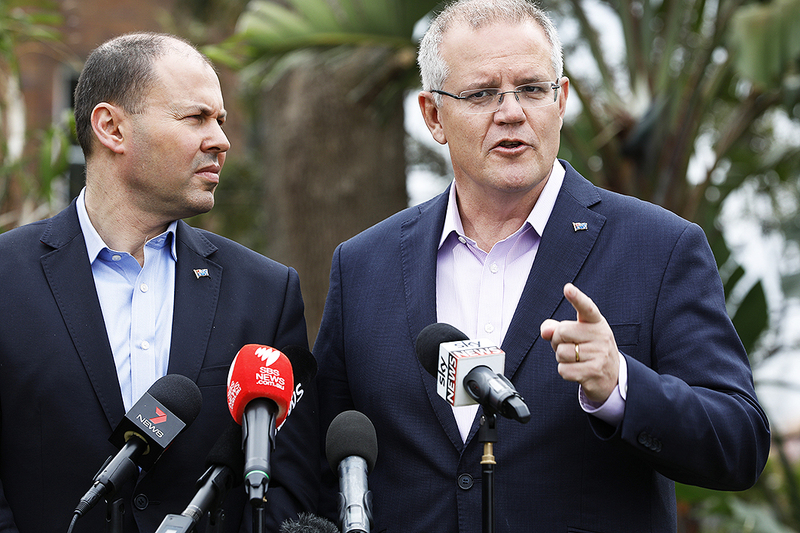 Ryan is an economic dry and no bleeding-heart liberal, but he lives in the twenty-first century, and he’s not prepared to see his party dragged away from mainstream Australia and made unelectable. This fight will be a long and bitter one. For what it’s worth, the bookies now give the Morrison government just a 20 per cent chance of re-election. If the federal election results in a landslide like this, the Coalition parties will have lots of time to decide which century they want to live in. It will not be a battle for the faint-hearted. 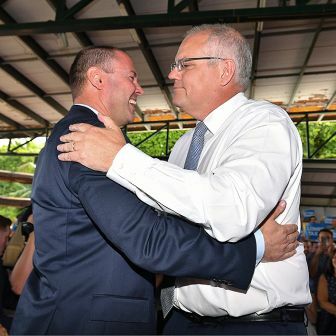 Even that could be rash: more than six seats are in some measure of doubt, including two Coalition seats in the bush, where there’s an outside chance that independents could vault over the field on preferences. Of the six seats I count as too close to call, Labor leads in three (Bayswater, Hawthorn and Prahran), the Coalition in two (Caulfield and Ripon) and an independent in one (Mildura). Labor will end up with roughly twice as many seats as the Coalition parties. 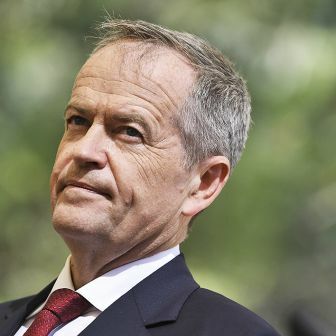 With 80 per cent of the potential vote counted, Labor’s vote had jumped 4.7 per cent from the 2014 election, while the Coalition’s vote plunged 6.6 per cent. 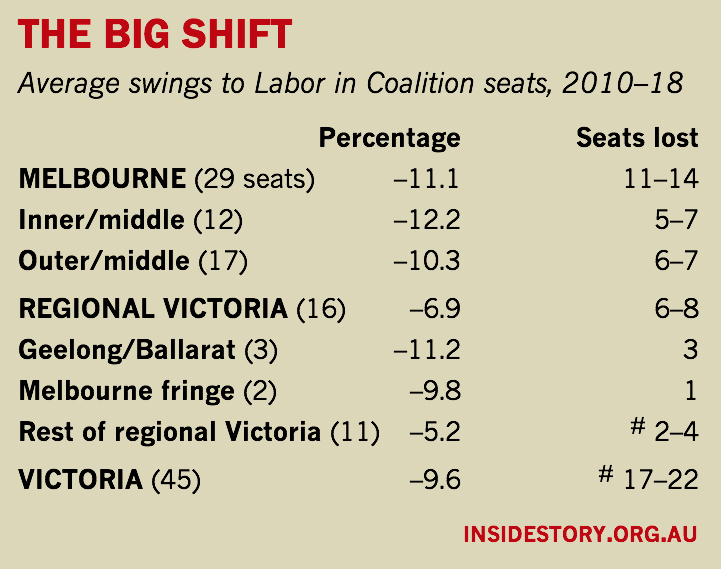 The median swing was 6 per cent in Melbourne and surrounding seats, just over 5 per cent in the three regional cities (Geelong, Ballarat and Bendigo) and just 2 per cent in the rest of the state — where five seats, against the trend, recorded swings to the Nationals. To get a full picture of what’s happened to the Coalition, we should go back to 2010, when Ted Baillieu led it to an unexpected victory over an apparently impregnable Brumby government. It was a unique event; it is the only election, federal or state, that the Coalition has won in Victoria since 1996. It stands out sharply against the twelve losses in that time. 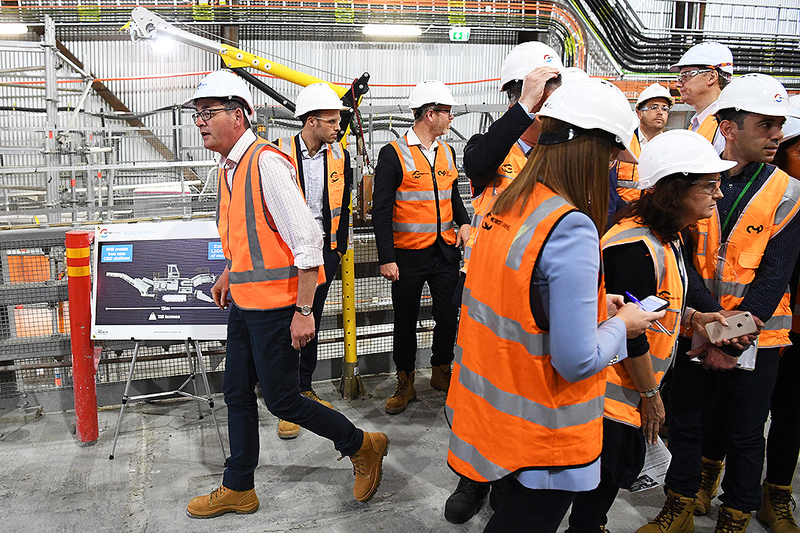 Baillieu not only hammered the Brumby government over its mistakes — the most glaring one being its decision to build a huge, ultra-expensive desalination plant at Wonthaggi, which has barely been used since. Along with the usual Coalition agenda of tougher sentences, cutting waste, and so on, he also put forward a positive agenda for open government, including an anti-corruption commission and a plan to tackle Melbourne’s high construction costs. He was known as a liberal: tall, tolerant, intelligent and progressive. Victoria decided to give him a go. For reasons too many and too complicated to explain here, it didn’t work. Baillieu was forced out in early 2013 after rogue backbencher Geoff Shaw defected to the crossbench. Denis Napthine took his place but was unable to turn the ship around. 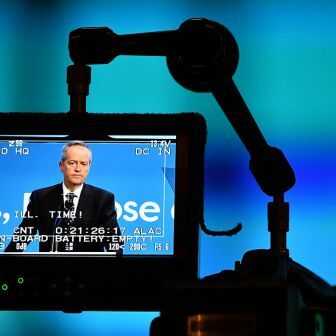 Labor returned to power in 2014 on a 3.5 per cent swing. The Coalition lost the four Frankston rail-line seats to Labor, Prahran to the Greens and Shepparton to independent Suzanna Sheed, while gaining Ripon. This is the second election in a row at which the Coalition has suffered a heavy swing. 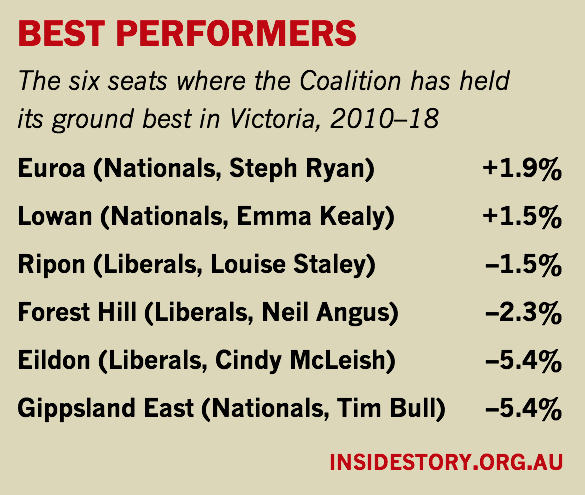 In the seats it notionally held going into the 2014 election (based on Antony Green’s estimates for the Victorian parliament), the combined swing over those two elections has been 9.6 per cent. That excludes the three seats it has lost or looks like losing to independents: include them, and the average swing is over 10 per cent. One in five Victorians who voted for a Coalition government in 2010 voted against them this time. Sources: Antony Green’s estimates of 2010 vote on new boundaries, and 2018 election results. Swings counted for forty-four seats notionally won by the Coalition in 2010 and contested against Labor or the Greens in 2018. # Seats lost total includes seats lost or possibly lost to independents. Part of it was an inner-suburban revolt. Take Hawthorn. It is one of the four seats of Melbourne where rich people congregate. It has been rusted on to the Liberal Party. Labor has won the seat only once in 120 years. In 2010, Ted Baillieu won Hawthorn by a thumping two-to-one majority. Now his successor, shadow attorney-general John Pesutto, a well-regarded frontbencher seen by many as the next leader, trails by 154 votes and Labor is confident of taking the seat. Hawthorn, a Labor seat?! Its wealthy neighbours Kew and Malvern, which includes Melbourne’s most exclusive suburb, Toorak, are now marginal seats. In the two elections, the combined swing against the Liberal Party has been 16.8 per cent in Hawthorn, 14.5 per cent in Malvern, 11.1 per cent in Kew and 13.3 per cent in Brighton, where nineteen-year-old student Declan Martin, who joined the Labor Party only two months ago and spent just $1750 on his campaign, almost won a seat Labor has never held before. Why? See the analysis above. Whether the issue is climate change, patriarchy, race, gender or mode of transport, the Coalition seems to be clinging to the values of last century. The killer ad of this campaign was Labor’s billboard depicting opposition leader Matthew Guy with Tony Abbott, Peter Dutton and Scott Morrison. All of them are unpopular in Victoria, where the polls suggest the Coalition will lose heavily next May. A ReachTel poll for the CFMEU this week reported that even industrial relations minister Kelly O’Dwyer would lose her safe seat of Higgins. Frankly, I’ll believe that when I see it, but it captures the mood. Guy did have more positive things to say on issues like decentralisation, but they got lost in the endless negative campaigns that the Coalition and its media Siamese twin, Murdoch’s Herald Sun, kept hammering at voters: the “red shirts” scandal of 2014, in which Labor hired campaign workers at taxpayers’ expense, the Skyrail elevated train line, and others. These issues failed to connect. Voters were sceptical that changing the government would change the crime rate. They believe parties constantly rort the system, and the “red shirts” scandal was small beer once Labor repaid the money. As for Skyrail, the elevated line ran mostly through the seat of Oakleigh, and voters there didn’t mind at all. Oakleigh gave an 8 per cent swing to Labor. In 2010, the Coalition held twelve seats within fifteen kilometres of the CBD. Over two elections, it has lost roughly half of them: Bentleigh, Prahran, Burwood, Mount Waverley, Box Hill and possibly Caulfield and Hawthorn. Those it still holds are now marginal. But it is not just in the inner suburbs that the Liberals have taken a hammering. It is throughout Melbourne. On the other side of that fifteen-kilometre line, it has already lost another six seats, and Bayswater looks likely to be a seventh. Yan Yean, on Melbourne’s northern fringe, is booming with new housing estates. Labor has built a new train line to Mernda for them, it’s duplicating the main road, and it’s stashing the place with services. Yan Yean too has recorded a 16.8 per cent swing against the Coalition since 2010. What its voters want and what the Coalition offers are two different things. 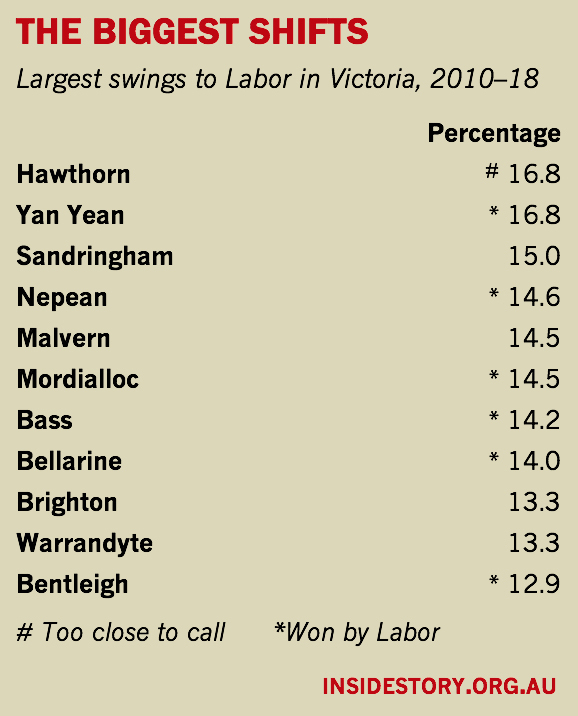 With the solitary exception of Forest Hill, where new residents are largely Chinese Australians, every Coalition electorate in Melbourne has recorded a swing to Labor since 2010 of at least 7 per cent. The Coalition went into this election with just six sitting female MPs. Four of them are on this best performers list. A fifth, Heidi Victoria, is just outside it. It is only fair to add that the party did endorse female candidates for roughly half of Labor’s marginal seats. But they all lost in the landslide to Labor. 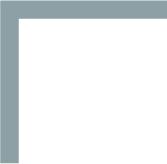 Meanwhile, the two retiring female Liberal MPs in the Assembly, Louise Asher (Brighton) and Christine Fyffe (Evelyn), were replaced by just one new one, Bridget Vallence (Evelyn). If the Liberals lose Heidi Victoria from Bayswater, as appears likely, Vallence will be the only woman among the sixteen or so Liberal MPs from Melbourne. Victorian Liberal president Michael Kroger suggested this week that long-serving male MPs retire to create vacancies for women to come through. But just three months ago, Kroger himself steered through a new rule to scrap preselections and renominate all federal MPs. It was widely seen as a move to save long-serving right-wing MP Kevin Andrews from a preselection he might lose. Second, the only part of Victoria where Labor has not gained much traction has been in regional Victoria — above all, in areas more than 200 kilometres from Melbourne that have always been safe Coalition territory, at least until Cathy McGowan showed they could be won by independents. A year later Suzanna Sheed followed her example by taking the previously safe Nationals seat of Shepparton. This time former Nationals MP Russell Northe — who quit the party last year saying he was suffering depression after allegations of financial irregularities, unpaid loans and a gambling addiction — held his seat of Morwell as an independent against the combined assault of the Liberals and Nationals. In distant Mildura, a young lawyer, councillor and former Labor candidate, Ali Cupper, appears on track to narrowly defeat Nationals MP Peter Crisp. Independents also have an outside chance of scoring upsets in Benambra, based on Wodonga, and South-West Coast (formerly Warrnambool) but need improbably strong preference flows to pull it off. Glenn Druery’s success in turning candidates with minimal support into senators or MLCs inspired a record number of candidates to stand for the Legislative Council. Record numbers of them will win seats when the final votes are tallied on 11 December. More on that when the outcome is clear. In the same way, the success of the independents is bound to lead to more of them standing next time. Cupper came within cooee of winning Mildura in 2014; she has effectively been campaigning ever since, and this time it looks like she’s done it. Next time the independents will be more formidable again, threatening safe seats on all sides. What the independents share is a complaint that their areas have been overlooked because governments focus taxpayer resources on the marginal seats that matter for their own re-election. And they’re right. The only way to change this, they argue, is to make your own safe seat marginal — by voting for an independent. They’re right again: Suzanna Sheed delivered far more for Shepparton from a Labor government than Nationals MPs were ever able to deliver from their own governments. This election saw concerted attacks by independents in several previously safe Labor seats in the western suburbs. They all failed, but some came close enough to put the wind up Labor MPs, including treasurer Tim Pallas in Werribee. One suspects that we may see a different approach to resource allocation in this term of government. Amid all the retribution, we shouldn’t forget that voters vote primarily on their judgement of governments — and clearly they have given the Andrews government a positive endorsement. The economic times have suited Victoria, and jobs have flowed to match the record flows of new migrants. But the government has also been building the infrastructure that Melbourne is crying out for. The voters like it, and they’ve rewarded the government for doing it. Two days before the election, Labor revealed the most important policy announcement of the campaign. After secret discussions with the ratings agencies, it announced that it will finance the construction of its $80 billion infrastructure wishlist by gradually lifting the state’s net debt from its current limit of 6 per cent of gross state product to 12 per cent. This is a very important policy shift by Labor — and by the ratings agencies — and a welcome one, so long as it chooses its projects with care and economic rigour. The next big event in the electoral calendar is the New South Wales election on 23 March. Premier Gladys Berejiklian must be hoping that her voters likewise reward her government for its infrastructure blitz (which, unlike Victoria’s, is largely funded by the federal government) rather than punish it for being made up of Liberals and Nationals. The bookies think so. They give the Coalition a 60 per cent chance of winning in New South Wales, as against a 20 per cent chance of winning the federal election. But then, at the start of the Victorian campaign they gave Matthew Guy a 30 per cent chance of winning. In reality, he had no chance.